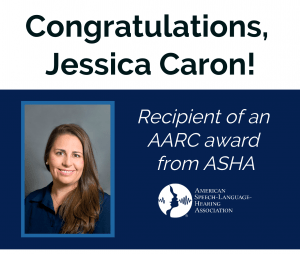 Dr. Jessica Caron has received an Advancing Academic-Research Careers (AARC) award from the American Speech-Language Hearing Association (ASHA). The AARC Award supports the academic-research careers of junior-level faculty in the field of communication sciences and disorders (CSD). The award will provide Jessica support for planned mentored teaching and research activities. Jessica’s research seeks to improve poor literacy outcomes for individuals who use augmentative and alternative communication (AAC), through the use of technology to train relevant stakeholders. Currently a gap exists between researcher outcomes and clinical uptake in the implementation of adapted literacy instruction. Her mentored research plan includes the opportunity to learn about implementation science and conduct pilot work in preparation for a larger translational study. Additionally, Jessica’s research interest in the use of technology to train relevant stakeholders extends to her aspirations to use innovative and effective pedagogical methods within the classroom. Her mentored teaching plan includes goals for developing blended learning experiences in order to prepare preservice SLPs; online modules will be developed and used within the current undergraduate AAC course that Jessica teaches. Dr. Janice Light will serve as a mentor related to research goals and Dr. David McNaughton will serve as a mentor for teaching goals. Welcome to Allison Barwise and Kelsey Mandak! Congratulations to Emily Laubscher, doctoral candidate!